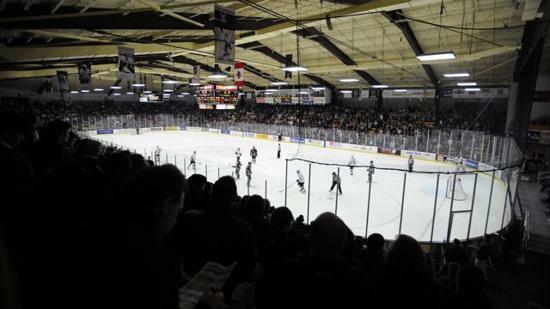 WMU’s Lawson Ice Arena is a great old barn. In an odd “home” series, Western Michigan (11-10-3, 4-7-3-3 7th NCHC) will host #9 Miami (15-9, 8-6 T4th NCHC) in Kalamazoo tonight and again next Saturday in Chicago as Miami once again will go outside to play at the Hockey City Classic for the second time in three years. Earlier this season, Miami swept a home NCHC series in Oxford by 1-0 and 5-2 scores while the Broncos were really struggling. But, Andy Murray’s squad has faired much better over the past several weeks going 8-2-2 over its past 12 games including a demolition of defending national champion Union in the Shillelagh Tournament in South Bend, Ind. For Miami, these are two incredibly important games. I suppose every game down the stretch for the RedHawks is important as they struggle to maintain a top four league finish and secure home ice in the first round of the playoffs. What’s clear is Miami has a very difficult schedule down the stretch and they’ll have to perform much better if they want to challenge for a regular season title — or at this point — a top four finish in the very competitive NCHC. The Broncos are a big, physical team. Most fans, coaches and pundits call WMU an “awful team to play against.” As they have gotten more confident in themselves, and head coach Andy Murray’s system, the wins have come. Junior Lukas Hafner has had an outstanding year for Western Michigan. As stated, this brutal run to the finish began last weekend. Miami stands 1-1 in the series of games that will largely determine their post-season fate. Miami has had difficulty winning important games and with Western Michigan perhaps in an even more desperate mode, I do not see Miami winning tonight but I do see a bounce-back in Chicago next weekend. Still, Miami really needs a sweep here. Will they have enough to rise to the occasion? After officially extending invitations to the schools on Wednesday, the NCHC became a reality for the Western Michigan Broncos and St. Cloud State Huskies on Thursday. This brings the total schools welcomed into the NCHC up to 8, and gives Miami a conference rival of sorts in Western Michigan, having spent the last 31 years in the CCHA together (WMU has been in the CCHA since the 1975-76 season and Miami joined for the 1980-81 campaign). Miami Athletic Director Brad Bates was present to welcome the Broncos with WMU director of Athletics Kathy Beauregard providing the big news to local media. As far as these two teams go, Miami has a slight 51-49-9 edge all time against Western Michigan, and a solid 7-1-1 record against the Huskies. Detroit, Mich. – For the fifth, and possibly final time this season, the Miami RedHawks (22-9-6) faceoff against Western Michigan (19-11-10) in the CCHA championship game at 7:35pm at Joe Louis Arena in Detroit. Wow, that opening line seems strangely familiar as do a lot of what I have to say below. It’s another case of an extremely experienced and talented RedHawk team taking on a much less experienced, albeit talented, group from Western Michigan. The RedHawks won the season series 2-1-1 splitting a pair in Kalamazoo and tying and winning in Oxford just a few weeks ago. The RedHawks could have easily swept both series as they lost third periods in two of the four games that led to a loss and a tie including losing a third period lead in Oxford. Miami is 8-1-1 against the Broncos in the last ten meetings but this is a much different team under former Miami assistant Jeff Blashill who has the Broncos playing great defensive hockey. And, in last night’s semifinal victory over Michigan, they exhibited a scoring touch like we haven’t seen much of this season. Much like against Notre Dame, Miami has a significant advantage in experience. Western Michigan hasn’t been to the CCHA Championship game in 1986. That’s before nearly, if not all, of their players were born. On the other hand, Miami has played in dozens of big games over the past four years and this senior class is trying to become the first to lead Miami to a Mason Cup. Something they can earn with a win tonight. It’s also likely that with a win, Miami would claim a #1 seed in the next weekend’s NCAA tournament which would be amazing considering Miami was 19th in the PairWise back in January. The RedHawks are peaking at the right time this season as they’ve made a tremendous late run. Overall, I think Miami has more weapons, is more experienced and is playing its best hockey of the season at the right time. Miami brings a 12-game unbeaten streak (9-0-3) into tonight’s game. Up front, Western is led by freshmen Chase Balisy and former Miami commit Shane Berschbach and senior Max Campbell. However, if you take Balisy and Campbell (their top 2 scorers) together, their point totals to do not equal Hobey Baker finalist Andy Miele’s season totals alone. With Reilly Smith, Carter Camper, Pat Cannone and Alden Hirschfeld elevating their games, Western does not boast the offensive depth that Miami does. Miami has a distinct advantage offensively. Named to the CCHA’s All-Rookie team, freshman Dan DeKeyser has done a tremendous job stabilizing and solidifying the Broncos blue line. As a 21-year old freshman, what he lacks in collegiate experience can be made up for by his overall maturity. And, at 6’2″, he has the size to counter Miami’s larger forwards and can still work to contain the smaller ones like Miele and Camper. Though he did not play yesterday against Notre Dame, Matt Tomassoni and the Miami defensive corps are playing their best hockey of the season. Against Notre Dame, Miami blocked 16 shots and allowed just two fluke goals (including a 5×3) in their semifinal win. Miami’s penalty kill was outstanding allowing just the one 5×3 against in six opportunities. With Miami’s experience and size, I like our blue line vs. theirs. Senior Jerry Kuhn has been outstanding for Western Michigan and he looked fabulous against Michigan last night making 29 saves in the Broncos victory. Against Miami, Kuhn is 0-1-1 this season as he surrendered three goals in both games in Oxford last month. For Miami, it doesn’t really matter who is in net right now, both Cody Reichard and Connor Knapp are playing their best hockey of the year. The real question for tonight is who will play? Knapp has played better against Western this year earning two victories and has allowed just two goals in two games including a shutout so he may get the nod from head coach Enrico Blasi. Like I said before the Notre Dame game, Miami has played in many big games over the past few seasons. They have the experience to know how to win in tough situations. Last night’s victory over Michigan is arguably Western’s biggest win in more than a decade. It will be interesting to see if they can channel that again tonight or did they spend everything they had in the semifinal win over the Wolverines. Again, I like the way Miami is playing bringing a 12-game unbeaten streak into play today. I like Miami’s experience and the will of this senior class to attempt to earn Miami’s first ever Mason Cup.